Ends of yarn don't belong into the trash. Collect them by the type and colours in jars. Mix just matching types. It's worth it. Tie them together - does't matter how long they are - you can use very short pieces as long as they are long enough to tie together. 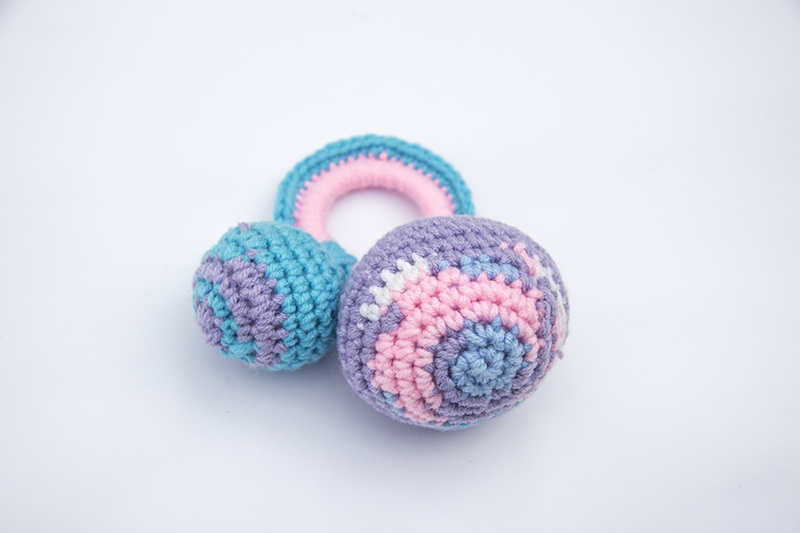 Then use amigurumi pattern and make small balls, fill them with polyfill knitting material or use IKEA pillow stuffing (cheapiest way - it costs only 0.90€) and rattle box from www.aliexpress.com. This is great way how to use useless pieces of yarn and make something nice. Rattle. - everything "amigurumi" - because you can hide all of the ends inside the toy and nobody knows how many knots are there. Colorful rabbit or teddy bear will be a nice gift for a little child. 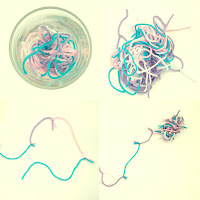 - if you have tones of the ends, you can make a long "snake" and stuff it with the IKEA pillow stuffing, it could be used as a TV pillow for family members. - or make a pillow case for you - who cares how many knots are inside? Who knows? Just you. - colorful balls for cats or dogs - oh, they will love them. Just one rule - AMIGURUMI.